Whilst “fishing” for lost/forgotten Dennis Wheatley correspondence last Summer I stumbled across The Dennis Wheatley Archive, kept by Leeds University as part of their Special Collections in the University Library. I was surprised I hadn’t heard of this collection before, particularly as it is only a short train journey away from my home (I don’t even need to change trains). A quick search of the online Dennis Wheatley Museum found no mention of it. Intriguing!! I delved deeper and found that there are 22 boxes in the archive. Surely, I thought, the DW community will be aware of these. So I sent a quick email to our very own CB and expected a nodding, knowledgeable explanation of the archive. WHAT???!! This way my Eureka moment - I felt like Howard Carter. 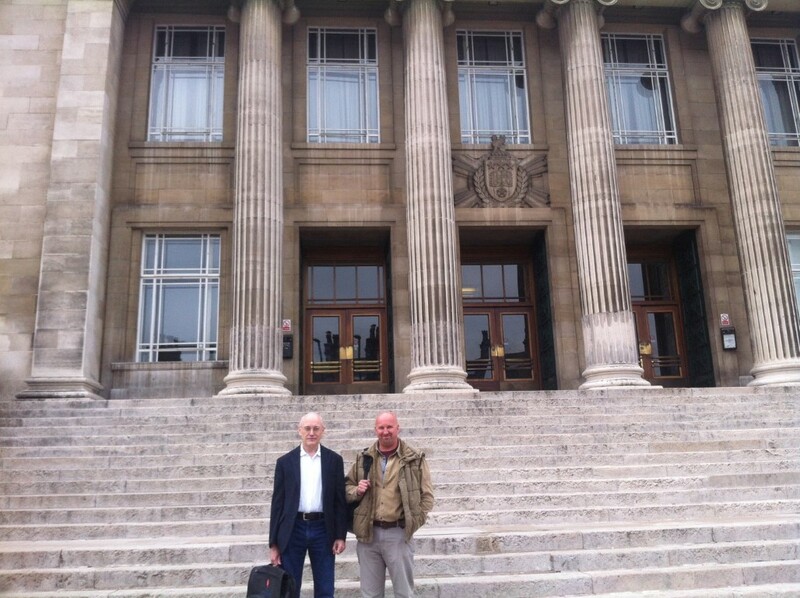 Early on a Saturday morning, 3rd October 2015 (yes it took 2 months), Charles Beck and I met outside the University Library in Leeds and, with bursting excitement, climbed the steps into the building. Having contacted staff in advance we were expected and were led to a large, wooden table and the first three boxes were brought to us to look through. As we opened the first box and viewed the contents we realised that our 3 hour time limit (Saturday hours) was no where long enough to give each box a thorough examination. It was crammed – and the boxes were large (24”x18”x8”). The staff informed us that they had only recently acquired the collection (2014), it had been initially offered to the British Library who turned it down and referred the owner to the University Library at Leeds. The collection had been transferred from “Misland Capital”. Box 18 was brought out and placed on the table, Charles opened the lid and there, lying on top, was Dennis Wheatley’s handwritten manuscript of Letter to Posterity. The ceremonial regalia is curious. It is probably Masonic (one of the labels states “made expressly for the Grand Lodge”), but I am not aware of any Masonic connection with DW. As you will see in the description of each box below there are months and months of work to go through it all. We only had 3 hours and it took time to savour each find (new Christmas cards, publicity fliers, research materials, the Living Portrait script, Semisi Maya artwork and correspondence, decades of receipts, invitations, letters, letters and even more letters, etc., etc., etc....... . We had time to skim through about half of the boxes and decided a more organised follow up visit was necessary. Therefore, we simply took our time feasting on a few of the boxes, savouring each moment without taking notes and just a few photos. We can do all that later – they’re not going anywhere. It was over far too quickly, and at 1pm we were back out in Leeds city-centre where we met up with Nat, had lunch and enthusiastically discussed our findings of the last 3 hours. I am planning to return to the University Library on numerous occasions to spend a full day, making a full, detailed list of each box. When Darren rang me about material in the Leeds Special Collections, initially I thought he was referred to the Hilda Gosling material, of which I was aware. How wrong I was – this is a completely different collection. I have emailed Misland Capital to try to ascertain its origins, but haven’t had a reply yet. My suspicion is that it is part of the material that ‘mysteriously’ came up for auction at an obscure Bournemouth Auctioneer in August 1984, and about which I have talked at one of our Conventions. Maybe we will never know, but it is a magnificent collection of bits and pieces from across DW’s ages, and contains some truly fascinating material – including its ‘Letter to Posterity’ – which is a pencil draft of the ink manuscript that was eventually buried in DW’s garden. After the Sayer Collection which figured extensively in Phil Baker’s biography, and arguably one other, it is the largest collection of DW’s personal papers that I know of. It is therefore of enormous importance, and Darren and I will be paying it many further visits. It is good to know of its existence, and that it will be looked after carefully. Congratulations Darren for unearthing it, and congratulations to Special Collections for having the foresight to acquire it to preserve for posterity.